My brother is currently in Killarney, Ireland. 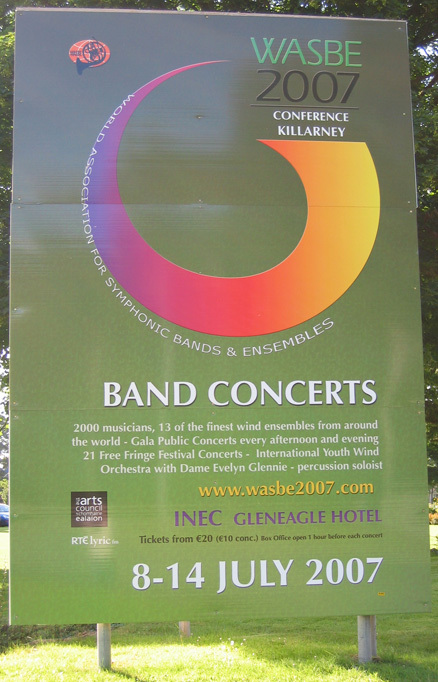 He is attending a World Symphonic Bands and Ensembles Conference. So if you are in the neighbourhood from 8th to 14th of July I guess you should not miss this event. He has been chosen to play in the WASBE International Youth Wind Orchestra as a lead tuba player. He is the only Slovenian musician to play in the orchestra this year. We're all very much proud of him. I hope he is enjoying Ireland. He took his camera with him, so I hope he'll share a photo or two when he comes back. If you are interested you can visit his Tuba Blog at tuba-blogging.blogspot.com. Congratulations! to your brother. It must be an honor to be chosen. Keep visiting my blog to know more about the coolest hill stations in india. Bye & have a great time. Just see won't you have interest to join us. We want your sunrise! And we want you to join us to broadcast a never ending sun. Live! The idea comes from one of our stupid thought: Why can't we keep a gorgeous moment that will never end? This is a project which needs people all around the world to achieve. We want people from different time zones to shoot the sunrises in their local places. Our optimistic outcome is installing 24 screens to display sunrises around the Earth. The Sun will keep rising from screen to screen, from bottom to top vertically. This 'never ending sun' will last for 24 hours in a day! In fact there are still many problems to solve, it's been a tough way so far. Therefore we are in need of supports. Your help will be most appreciated no matter in what aspects. It could be supporting us technically, joining us, spreading it out, giving us suggestions or anything else you could think of. You name it, we do it. Details please refer to our blog or website.